SECOND SLICE: WHY DON’T PEOPLE CARVE WATERMELONS FOR HALLOWEEN? - What About Watermelon? You are here: Home / Watermelon Carving / SECOND SLICE: WHY DON’T PEOPLE CARVE WATERMELONS FOR HALLOWEEN? SECOND SLICE: WHY DON’T PEOPLE CARVE WATERMELONS FOR HALLOWEEN? 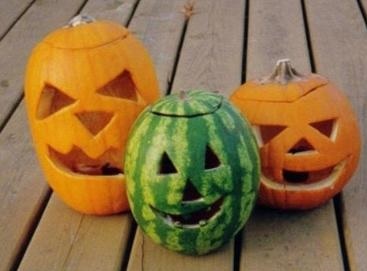 I love watermelon, which is why I have to ask the important question: Why don’t people carve watermelons at Halloween? The answer might lie in the history of pumpkin carving. According to Wikipedia, the practice of carving jack-o’-lanterns (which aren’t always made from pumpkins) dates back to early 1800s Ireland. Interestingly, the Irish carved turnips and swedes (rutabagas, not people from Sweden), lit them up with a lump of burning coal, and placed them on their doorsteps to welcome deceased loved ones and ward off evil spirits. It wasn’t until the practice was adopted in North America sometime in the mid-1800s that pumpkins were used, mainly because they were more readily available than turnips and also easier to carve. That last part (about pumpkins being readily available and easier to carve) might be the key to solving this mystery. Pumpkins are traditionally harvested in September and October, just in time for Halloween. That fact alone is probably a big reason why pumpkins (and not watermelons, which are more widely available in the summer) are used for the fall celebration. “Easier to carve” is another clue. While watermelon isn’t all that difficult to carve — in fact, its rind is actually easier to slice through than the harder-shelled pumpkin — the pumpkin is much more hollow than a watermelon, giving it a slight edge in the “easy to carve” category. The aforementioned hard shell of the pumpkin probably also helps it maintain its carved shape longer than a watermelon would. I should also point out that pumpkins, with their relatively flat base, are able to sit upright when carved, while many watermelons tend to have a mind of their own when placed on a flat surface. Anyone who’s had a watermelon roll off their kitchen counter to meet its untimely demise on the floor knows that all too well. For the final word on this topic, I turned to Hugh McMahon, a professional pumpkin carver I interviewed previously on the blog. Hugh has carved pumpkins and watermelons into hundreds (if not thousands) of amazing things and could definitely shed some light on why people prefer pumpkins over watermelon — at least for carving. “Pumpkins are less messy, which makes them a little easier to work with than watermelons,” said McMahon. He also pointed to the pumpkin’s position as a fall harvest symbol as a reason for its stranglehold on Halloween but didn’t rule out the use of watermelon in the fall and winter months. McMahon has carved watermelons for tropical-themed fall events, including a series of watermelons for Bette Midler’s annual “Hulaween” party fundraiser. “Occasionally, I break the rules for fun,” added McMahon. I propose that we all break the rules a little bit this year and save a pumpkin by carving a watermelon or two. Watermelon is a lot tastier than pumpkin pulp, and a lot easier to carve than a turnip, that’s for sure. How very interesting! I believe I too shall try carving a watermelon, but set it on a small round platter once finished. Now to investigate what I am going to create! Glad to hear you’ll both be carving watermelon for Halloween. Let me know how they turn out!